The weather is starting to heat up here in Los Angeles so I’m getting ready for a season full of frozen treats! The recipe that seemed to ignite your love of Big & Bold frozen desserts was my 2 Ingredient No Machine Ice Cream Recipe. It’s an Ice Cream that is made simply with Whipped Cream and Condensed Milk. The results are a light and fluffy blank canvas to which you can add any flavors your heart desires. My Homemade Sorbet is made using the exact same logic and engineering as my ice cream recipe. You need an ingredient (e.g. frozen fruit) to give you a thick base and add liquid sugar (e.g. condensed milk) to help it freeze. So I thought, why can’t I apply my ice cream technique to a sorbet? Well, you can, I did, it works and it’s awesome! Condensed Milk is an important ingredient in this recipe and can’t be left out. If you cannot buy it easily then I’ll do you one better and show you how you can make you own. The recipe is very simple and probably more cost effective than buying it in the store. You can find my Homemade Condensed Milk recipe here. Now that you know the basis for my recipe, you’ll find below 5 incredible flavor ideas featured in my Homemade Sorbet video. Be sure to check them all out and feel free to experiment to create any new favorites. Also, you can buy the same ice cream containers I use here on Amazon and check out a few of my favorite frozen treat accessories below. Plus, you can make your own Sorbet Labels with my template here. Sometimes simplicity is the best option because this flavor is like a burst of fresh raspberries in every creamy bite. Find my Raspberry Sorbet recipe here. When I think of sorbet it conjures images of lovely fresh flavors and that’s exactly what this one is all about. 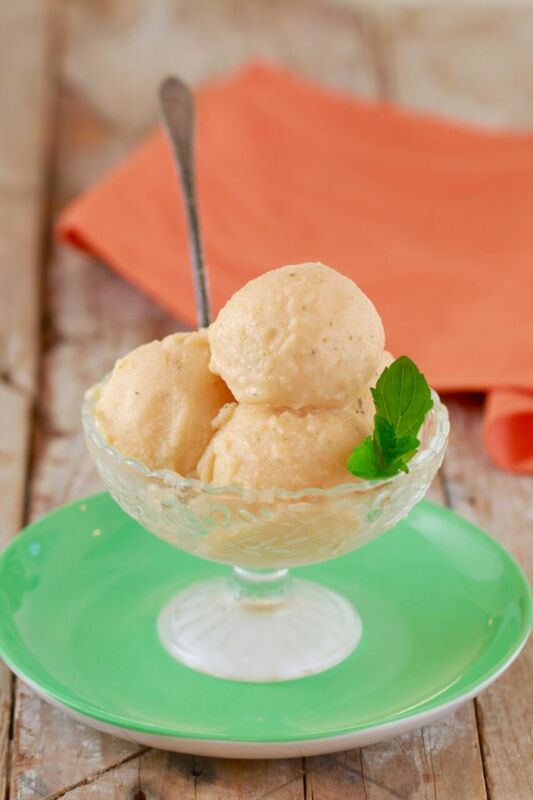 You can find my Cantaloupe & Mint Sorbet recipe here. A zest of a lime can lift any flavor into something extraordinary so just wait until you taste this Strawberry & Lime Sorbet. Find my Strawberry & Lime Sorbet recipe here. Combining these two sweet and unique fruits in one dessert is a tropical double whammy for your taste buds. Find my Mango & Passion Fruit Sorbet here. Don’t be fooled, sorbet doesn’t have to be just fruit flavors. This one is a rich decadent treat for any chocolate lover. Find my Chocolate & Banana Sorbet recipe here. Sign up for my Free Newsletter so you don’t miss any new recipes! I cannot wait to try these and other flavors. Besides the watermelon are there any other fruits you would not recommend trying with this? Hi, i’m delighted to hear that, you can use peach, mango, banana, apple, berry, it really is endless! Enjoy! Delighted to hear that, Jackie!! I love to hear that! These are some of my favorite fruit desserts. Omg all I can say is WOW WOW WOW !!! I just got home from a day out and opened Facebook and I saw this recipe and thought it cant be that easy !! IT IS THAT EASY !!! I love anything strawberry/banana so I know I would love this, if it turned out . I just put it kn the freezer but not before sampling of course 😁. I cannot wait to try more flavors!!! This is going to be a summer go to in my house ! Thanks Gemma!! Love it ❤❤❤ . P. S…… I dont even have my jacket off yet lol. Yay!!!!! Delighted to hear that, Lucy!! Hi Gemma… How can I replace Condensed Milk if I need to prepare it for a diabetic person? Hey Gemma! Can I make lemon sorbet with this recipe? I made the mango sorbet and the strawberry sorbet. Absolutely delicious! And they feel lighter and healthier than other desserts (not sure if that’s really true, but I like to think so!). Everyone loved them! I will try banana next. My KitchenAid food processor did struggle a little and became quite hot with the solid frozen fruit, so next time, I think I will leave the fruit out for 10-15 minutes to let it thaw a little. I am delighted to hear that! Enjoy! These sorbet recipes are easy to make and have a wonderful texture. In a week I have made Strawberry-Lime, Cantaloupe-mint, and Mango-lime. The mango-lime was hands down my favorite and the creamiest, but all have been a guilt free taste of summer. Today I am making peach(for me!) and chocolate-banana for my husband. Thank you so much for this summer treat and all the other tidbits for high quality kitchen basics! You Bold Bakers are so lovely to your family, always putting them first! You certainly deserve a special one just for you. I made blueberry sorbet. It was easy and so good. I ended up topping it with a little chocolate syrup, homemade of course. Blueberries and chocolate are so good together! I’m delighted to hear that!!! Thanks for letting me know. Made the sorbet using peaches. Delicious. I am in love with this stuff! Tonight I made banana and peanut butter with pecan. Instead of regular peanut butter (so many calories/fat!) I used PB2 which is powered peanut butter. It is all of the awesome protein and a fraction of the calories and fat. It is only 1 point on the WW system and I love it. Well, the sorbet was AMAZING. Many thanks! Good for you, I am really happy that you are experimenting with these recipes. Thank you so much for sharing your recipe here. Other bold bakers love to get these tips. I just made the strawberry lime sorbet and it’s fantastic and creamy! I almost skipped the lime but I am so glad I used it. It adds dimension and a pop of brightness. One question: I was unsure if I had the right ingredient… I used SWEETENED condensed milk. Is that correct? omg Lisa, the lime is the best part!!! I’m glad you used it. Yes, sweetened is correct. The sugar in the condensed milk makes it possible to scoop the sorbet and stops it form freezing rock solid. I tried this today. I made blackberry. I tried it out as I was putting it in the freezer. It has a wonderful flavor. Thank you for this recipe. Thank you for this lovely review of this recipe, I can almost taste it! Thank you very much fro your lovely message. I’m really thrilled you like my recipes. Can I use lichis for this? Unfortunately using my method you can’t make lemon sorbet. You would need a different recipe and an ice cream machine to churn it. That’s so delicious and yummy. I really wanna enjoy it. A lot of sorbet recipes online call for freezing fruits overnight. I just wanted to ask wether it was necessary to leave them in the freezer for 24 hours. Also, If I were to take the fruits out of the freezer after only a few hours, would that effect the texture of the sorbet? There is a good reason for freezing the fruits, and now many places sell really good quality frozen summer berries too, and at good value. freezing the fruits suspends the ‘water’ content of the fruit, in other words the ice! This really does change the texture of the frozen sorbet. A traditional sorbet would be frozen, and churned through the freezing to do exactly this, otherwise it would be a block of ice! It really depends on the recipe. A processor does a particular job, which a mixer cannot do. A stick blender is very useful for some jobs, but again, not for every one. For the sorbet you are trying to blend frozen fruits, which will not be possible in a mixer. If you need a liquid sweetner can I use agave instead of the condensed milk? Musk melon (also called canteloupe) is high in water is therefore important that the melon is frozen, this suspends the ice crystals, for a smooth finish. The condensed milk will also be best if it is slightly chilled, especially in a warm place. It is important that you use the right ingredients too, and I trust that you did. The sorbet should form in the processor, not turn to liquid. Evaporated milk is not the same as condensed milk. For how long should one freeze d musk melon or any other fruits for sorbet…? usually in a domestic freezer this will freeze in about 8 hours. it does depend on how you do it. If you open freeze it, that means flat on a tray, it will be quick, and will be easy to transfer to a bag, and to add to a recipe too as it will be in individual pieces. Condensed milk from the market should be good! I use the steel blade of the processor for everything really. I have a good food processor and it takes all I throw at it! Blending frozen fruit in a blender is tricky as it needs a start, and usually this will be a liquid, such as milk for a milkshake, fruit juice etc. I would like to try using durian in my sorbet, but I’m afraid the sweetness of the condensed milk might be overpowering. Is there anything to bring out the flavor of the durian (or would just durian be alright)? And if I were to use only durian, what would the ratio of durian to condensed milk be? I do not have access to this amazing fruit, it does not travel well, as you probably know. I think you can experiment with this. milk will not condense without sugar, it is a caramelized milk really, brought to soft ball stage, which is what thickens it. Durian is a very strong flavor, and I do not know what would further enhance it, I am sorry. My instinct would say lime, but that may not be right! Could you put frozen watermelon into a sorbet? Do you think the flavor would come through well as a sorbet? I have extra frozen watermelon that I don’t know what to do with. This sounds delicious, and I would not waste it. Yes, you could make a sorbet with this, but be careful about the seeds, you do not need to be processing these! Add something to lift the flavor, zest of a well washed lime/lemon/orange will do it! this is a high water content fruit, and so may be a little icy, but it will be refreshing and delicious. good luck with this! You can dehydrate a pear and use it that way by extracting the water? great question! you need frozen as it blends up really thick when frozen. Can I use frozen raisins too? And maybe banana alone? What would the taste taste like? Frozen raisins will be too sweet for this, and not the right texture. Lime and coconut, berry crumble, egg nog, butterscotch ripple, raspberry cheesecake. All of these are more or less are variations of the existing sorbets or ice creams I’ve seen you you make Gemma. I have a few more ideas too but it’s early in Vancouver and my brain just isn’t working yet? I’m simply dumbfounded. I’ve made sorbet the old school way that takes so long and can be so messy with simple syrups etc. I have extreme dietary limits but sorbet is on the menu. Are you planning on making more? Citrus makes amazing sorbets, as does Concord grape, kiwi/lime sounds delish, but you are far more creative than I am, so I would love to see more recipes, please? Thanks Ryan?? Yes, the traditional sorbet is fabulous, an citrus would be a favorite of mine too. The problem with my method is that it relies on a fleshy fruit, in order to ensure a smooth finish. The condensed milk is also low in water content, so freezes smoothly. The water content in the citrus freezes like ice, and will form crystals, unless it is churned or whisked through the freezing process, this fines down the ice crystals, and suspends them. for kosher salt read Sea Salt, not refined table salt – this is really what this means. Durian!! Jury out, I do not think I will be trying it! Perhaps a bit of alcohol like orange liqueur or the like would make the ice crystals smoother in the case of icy citrus? It surely wouldn’t take much and would add another dimension of flavour? Thoughts? FoYes absolutely add a teaspoon or 2 of a liquor and that will help a lot. Good idea. This looks amazing! Can you put these recipes in a ice cream maker too? My kids love make ing ice cream with me, and I’m afraid it would be to hard for them because my boys are too young. Have any advice on this Gemma? Thank you in adavance! ? I love your recipes and watch your channel all the time. I was wondering if the condensed milk can be substituted for corn syrup or glucose for a dairy free and coconut free version. I’ve seen corn syrup used but always with kosher salt for some reason. I’ve read hundreds and hundreds of recipies. Hope that helps, maybe Gemma knows why? Thanks so much I love your recipes. Your non-dairy icecream turned out brilliantly for me!! Unfortunately though my mango Sorbet turned out sickly sweet and not tasting much of mango at all. I have a habit of putting less sugar in recipes than a recipe specifies anyway, so any ideas where or how I went wrong?? Thanks in advance! Hi gemma! I used this recipe with tropical fruit (I live in tropical country,tho), like avocado, papaya, durian, sapodilla, and rose apple. it tasted delicious! and my family asked me to use this recipe for business. can i ask your permit, please? There is no such thing as an original recipe, they are all based on other recipes, traditional recipes etc. Plagiarism is a different thing, it is passing off other people’s work as your own, in a publication, online etc. Durian sorbet? I’m curious if it smells so strongly when it’s frozen, because it’s overwhelming when it’s not? Thank you??? I tried out strawberry sorbet and it turned out really well. Thanks so much for easy recipe. I and my kids always watch your blog. By the way, what food processor you would recommend for baking and making ice cream. My blender does not work well. Thanks so much. Thank you, and your kids, for being with us. I am happy that you are enjoying the recipes. I use a range of mixers and processors, but withing two brands, KitchenAid, and Cusinart, both of these are good quality and will last a lifetime with careful use at home. They are on the higher side of the price range but so worth it, you get what you pay for with kitchen appliances! And can u please give me a recipe for it. Thank you! Hi Gemma! Can I do the same recipe with cherries? Thank you! As someone who has long suffered with the long way of making sorbet, which tastes great, you can make a simple syrup 1 cup water 1 cup sugar of choice and there’s your sweetener. It will require an ice cream maker/machine though. I think Gemma is right on myself??? Hi Gemma, would pomegranates work well with this recipe? I was thinking of juicing some pomegranates, but not sure if the resulting sorbet would turn out too icy. P.S. Love how clear and easy-to-follow your Youtube videos are! Ii think fresh banana could only be suitable as a topping otherwise it would be a purée., but maybe that’s your intention? Hi gemma, would pear(the crunchy ones)and lime sorbet be a good combination? Lime is kind of tropical where as pear is more of a fall flavor. I would say Pear would be tough to make as a sobet as it won’t freeze well and will watery.